Successfully Added Xiaomi Redmi 4 Prime Smartphone - Snapdragon 625 2.0GHZ CPU, 3GB RAM, Android 6.0, 4G, Dual SIM, 5 Inch FHD Display (Grey) to your Shopping Cart. One of the major highlights from this first week in November 2016 is from the Chinese smartphone industry with the launch of the new Xiaomi Redmi 4. The successor to the ever so popular Redmi 3, this new smartphone is a stellar offering that is sure to be just as popular due to its high-end specs, lush design and surprisingly affordable price tag. The hardware has it all, a Snapdragon 625 64Bit CPU with 8 cores and clocked at 2.0GHz, 3GB of RAM and the Adreno 506 GPU, this offers a strong performance for games and streaming HD content, which is nothing short of what you'd expect from a top flight phone. Once again Xiaomi has put together the complete package and the Redmi 4 looks and feels similar to its predecessor albeit a with a slightly more premium build and faster processing capabilities. A 5 inch full HD display with 2.5D arc glass graces the front of the phone while the sides shine with the metal frame that brings great strength, to the rear is a 13MP camera, two-tone LED flash and a fingerprint scanner so everything you need for taking great photos and securing all your personal data. Running on Xiaomi's custom operating system, MIUI 8.0 you get a fresh take on the popular Android 6.0 Marshmallow with all the standard functions and extra choices to boot. The phone also benefits from a larger than average battery boasting 4100mAh of juice which is more than enough to keep you going throughout the day. 2 SIM card slots with 4G support covering bands FDD, B1/B3/ B7, TD, B38/B39/B40/41 allows the phone to be used through Asia, Africa, Europe and more. With two IMEI numbers you can take command of two phone numbers allowing you to avoid roaming charges or manage business and personal contacts more effectively. 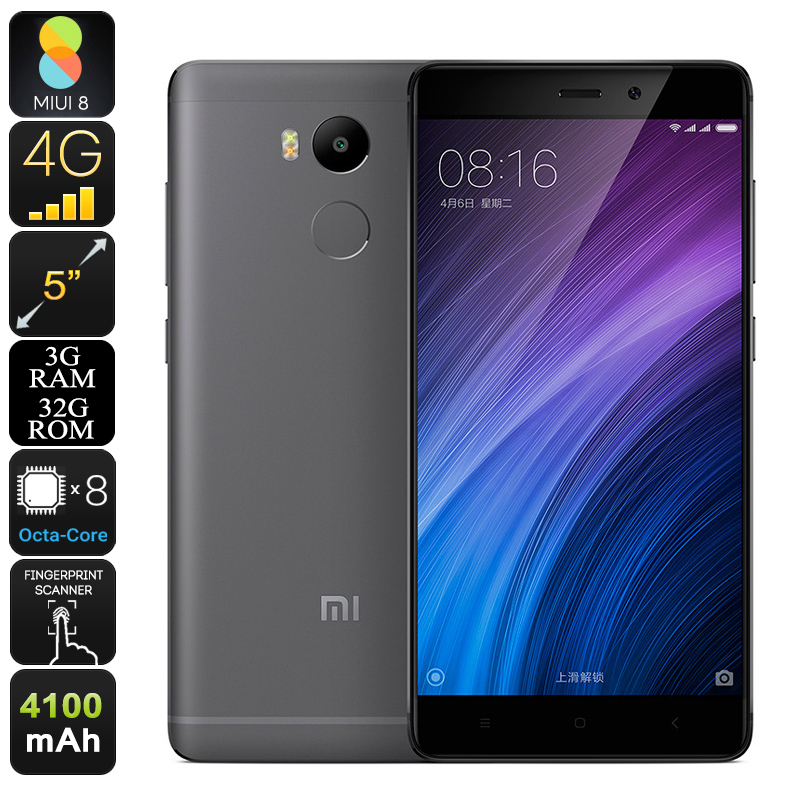 When it comes to affordable Chinese smartphones Xiaomi takes the lead with its new Redmi 4 which comes with a 12 months warranty, brought to you by the leader in electronic devices as well as wholesale Android smartphones.. Awesome I love this phone and buying it from here I save myself some $. It does what i need it for & preforms awesomely. Good sound, love the speed of the phone, easy to set up & run in my country. Txting emailing from this phone is no problem. making phone calls are easy as & clear as. good battery life also. I only had the phone for a sort time now I wish it came with a case/flip-case. Anyway I got one coming. Overall I can not find any bad points at this stage & I don't think I will.